This drill from Coach John Calipari teaches players to share the ball on offense, with good, quick, accurate passing and the eventual open shot. 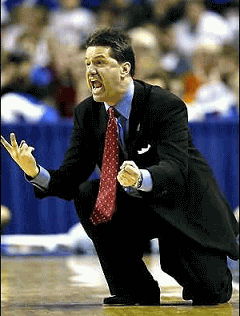 When a perimeter player receives the pass, the next player over yells "one more! ", indicating that he is open for the shot, and there would be one more pass made. Coach passes to O1. As O1 receives the pass, O2 is shouting "one-more! ", and O1 quickly passes to O2. O3 yells "one- more! 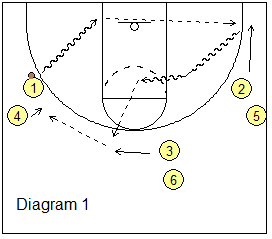 ", and O2 passes quickly to O3 in the corner for the 3-point shot (or one-dribble jump shot). After passing to O3, O2 cuts inside. 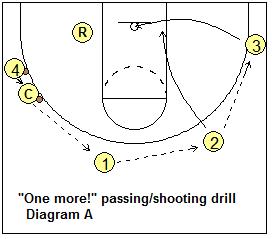 Pointers: Players must call out "one-more" to get the next pass. Passes must be made very quickly (a "hot potato") and accurately. Player rotation: See diagram B. Players basically follow their passes to the next spot. O1 goes to O2's spot, O2 cuts inside and then goes to the corner spot. After shooting, O3 circles under the basket to the opposite side, and O4 takes O1's spot. See diagram C. The drill is the same as above, except now we are pretending there is a defender over-playing the passing lane from O2 to O3. 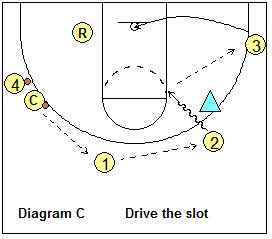 O2 dribble-drives the slot to the elbow, and quickly passes to O3 in the corner for the shot. The player rotation is the same as above. Now we will pretend there is a defender over-playing the top passing lane from O1 to O2. O1 quickly dribble-drives inside, getting to the "help-line" in the middle of the paint, and quickly, accurately passes to O3 in the corner. O2 yells "one more! ", and O3 passes to O2 on the wing, and O2 takes the shot. Pointers: Make sure that O1 makes the dribble-drive quickly, without hesitation, and make sure that O1 gets to the middle of the paint before passing. We don't want a pass from the opposite lane line. Again, players must call out "one-more" to get the next pass. 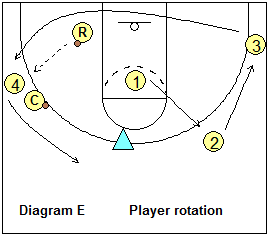 Player rotation: See diagram E. Players again follow their passes to the next spot. O1 pops out to O2's spot. After shooting, O2 goes to the corner spot. O3 circles under the basket to the opposite side, and O4 takes O1's spot. See the diagrams and video clip below from coach Kevin Boyle (Montverde Academy in FL Head Boys Basketball Coach, 2018 High School National Champions, 2018 Naismith High School Boy's Coach of the Year). 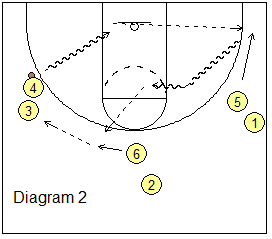 O1 dribbles baseline from the left wing and passes to O2 in the right corner. Notices that O2 starts on the opposite wing and then drifts down to the corner when he sees O1 making the baseline dribble-drive. O2 gets the pass, makes a shot fake and dribble-drives into the middle gap, as O3 drifts a few steps to the left. O2 passes out to O3. O3 quickly makes the "one-more" pass to the next left wing player in line (O4). In a game, this could be an open shot. 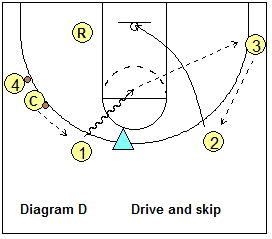 But we keep the drill going and O4 starts the new sequence driving to the hoop (diagram 2). 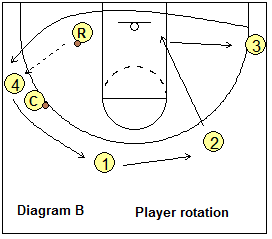 Rotation: Players follow their pass in the rotation (see diagram 2). O1 goes to the right wing (O2) line. O2 goes to the top (O3 line) and O3 moves to the original O1 dribble-drive line (left wing). From "Kevin Boyle: End-of-Game Winning Strategies & Plays"